Braces used to be the only way to straighten teeth. Now we can straighten teeth without using the traditional braces of brackets and wires! 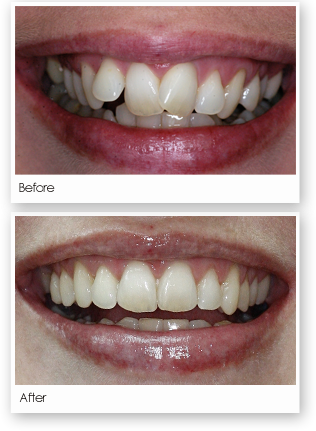 a patented system using a series of clear, removable aligners to gradually reposition teeth. impressions, photographs and x-rays of your teeth are taken and sent with a treatment plan to the lab. the lab creates the aligners- a set of precisely customized clear molds. each aligner is worn for about two weeks- removing them only to eat, drink , brush and floss. about every two weeks you will replace the aligner with the next one in the series. Your teeth will move, a little at a time, until they are straightened to the desired position. it typically takes nine to 15 months to complete treatment. The time it takes to complete treatment will vary according to your specific circumstances.